I know this is a bit late but I’m Miss February, for the third year running! Or at least one of my eggs is Miss February. Click here to see a preview of all the wonderful photos and find out how you can order a 2014 calendar for your very own. Creating beauty on eggshells can be a time-consuming and lonely process but thanks to modern technology I am part of a worldwide egg art family. To me, this calendar is tangible proof that even though separated by miles, we are a community connected through our art. This entry was posted on March 13, 2014 by teresamharbert. 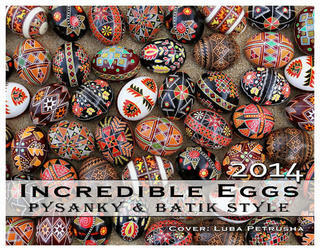 It was filed under art, egg art, egg artist, egg decorating, Ukrainian eggs and was tagged with calendar, community, Egg art, Pysanky, Ukrainian eggs.